I have updated this article to correct for the removal of the “dffs_tdWrap” div in the later versions. This page contains examples on how to use CSS to style the DFFS enhanced form. All discussions and requests for new examples must be done in the forum. If you do not have a user account, please look at the sticky post in the top of the forums for instructions. DFFS automatically adds a class to the side-by-side columns based on the index from left (starting with 1) so this code example will target the first four columns. The example uses a comma separated list of class names, but you can split these up in different rules to set a different style for each column. Advanced users can use the developer tools to inspect the side-by-side fields to find other classes and ids to target with custom CSS. 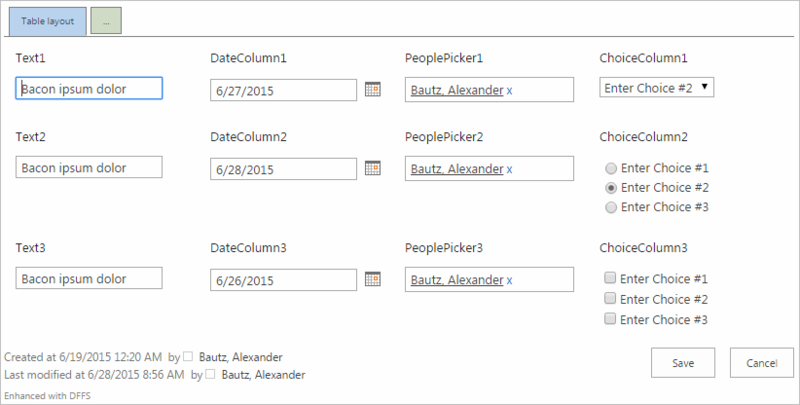 Change YOURFIELDINTERNALNAME with the internal name of your field. In the Field CSS tab you can override the CSS for individual fields. Here is a few examples. You can request more examples in this DFFS forum – see link in the top of this page. Hope this makes styling DFFS forms easier.